Baha Mar Senior Vice President of Government & Community Relations Mr. Robert Sands, University President Dr. Rodney D. Smith and Director of Development and Golf Classic Organizing Co-Chair Mr. Peter Mitchell. NASSAU, The Bahamas – University of The Bahamas (UB) has forged a partnership with the Baha Mar Resort Foundation to host a day on the links to raise funding for first-generation university students and grow the university’s endowment as it strengthens connections with alumni, donors and friends. The University Endowment is to realise the vision of the University of The Bahamas in perpetuity. The inaugural UB President’s Golf Classic & SPA Day will be held on Saturday, 3rd November 2018 at the Royal Blue Tavern Golf Course and the Caribbean’s first and only ESPA. 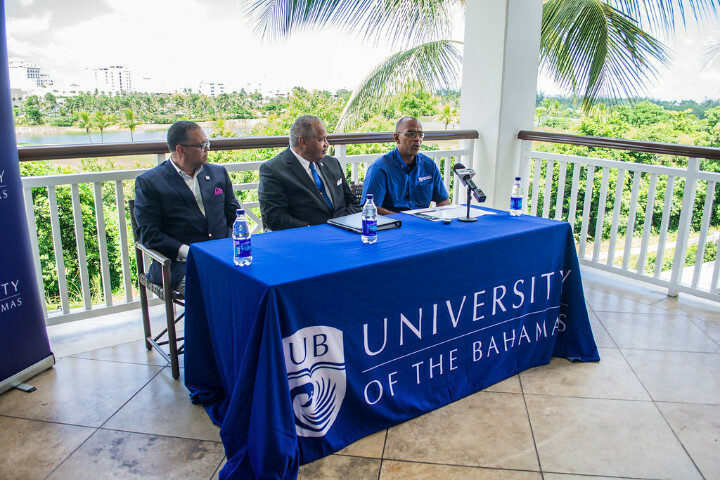 Baha Mar’s Senior Vice President of Government & Community Relations Mr. Robert Sands expressed his support of the partnership with UB and the upcoming fundraiser. “The pillars of the Baha Mar Resort Foundation are culture, community and conservation. 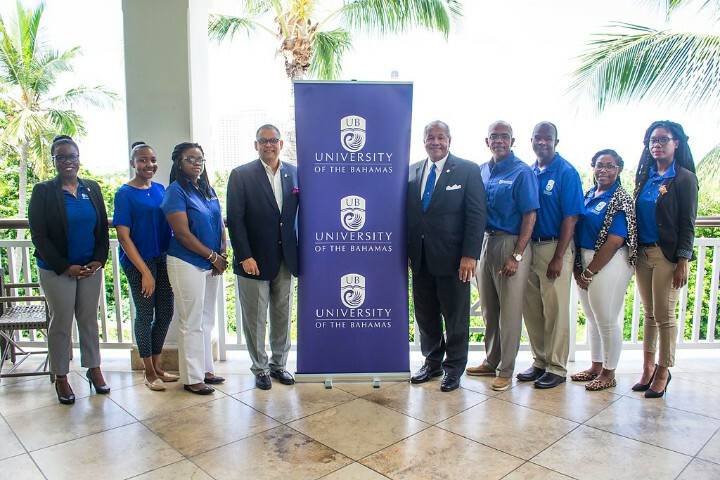 We are dedicated to positively contributing to the future of young Bahamians and delighted to partner with University of The Bahamas for the UB President’s Golf Classic and Spa Day,” said Mr. Sands. “We think that this is an excellent opportunity for partnership between the Baha Mar Resort Foundation and UB. We want to extend our sincere congratulations to the University for a very successful fundraiser and are excited to welcome everyone at Baha Mar’s Royal Blue Golf Course and ESPA on November 3rd. We also congratulate University of The Bahamas for executing this initiative and we look forward a long term partnership for a number of these classics in the future,” he added. Press conference to announce the inaugural President’s Golf Classic and Spa Day on Saturday, 3rd November 2018. University of The Bahamas President, Dr. Rodney D. Smith underscored the high value placed on preparing UB students for better lives in a global society through diverse cultural, educational and research driven experiences. “We are creating a campus that is more diverse and developing a comprehensive study abroad programme. A part of this diversity is exposing our students to a wider array of athletics, like sailing and golf. All of this is essential for the development of a first-class institution that will have national impact and it requires significant investment. For the University to grow in a consequential way, we must forge lasting public-private partnerships, and together we can build our national university. Baha Mar is one such partner, and they believe that an investment in education, is one of the smartest for the development and success of our country,” Dr. Smith noted. A vital catalyst for national development, UB has achieved significant milestones since its charter on 10th November 2016 as it grows to become a world-class institution. ‪Cultivating an environment for philanthropy while raising the profile of the institution remains of paramount importance. Director of Development and UB Golf Classic Organizing Co-Chair Mr. Peter Mitchell and his team are working to ensure the golf tournament is successful and the lives of students are transformed as a result. “We are sanctioned by the Bahamas Golf Federation and encourage all members to join us at the President’s Golf Classic and Spa Day. Additionally, we welcome the generous support of all UB alumni, friends and partners of this great institution. The tournament itself will be entertaining and engaging. We envision it to being an event which will build new friendships and partnerships. Patrons can enjoy a challenging day at Baha Mar’s Royal Blue Golf Course or persons who do not necessarily play golf can relax and calm the spirit, the mind, body and soul at the Caribbean’s first and only ESPA,” he said. On the green, individuals or teams will compete for top prizes including a hole in one competition for a 2018 Five Series BMW. To register a team or for corporate sponsorship information call, 302-4013 or 302-4337 or email, ubgolfclassic@ub.edu.bs. Chartered on 10th November 2016, University of The Bahamas (UB) is a beacon for national transformation. Approximately 5,000 students are enrolled in the University of The Bahamas system which includes campuses and centers on New Providence, Grand Bahama, San Salvador and Abaco, as well as UB online education. UB’s diverse academic programs, research engagements, athletics and leadership development experiences equip our students to become global citizens in a dynamic world. For more information visit www.ub.edu.bs.